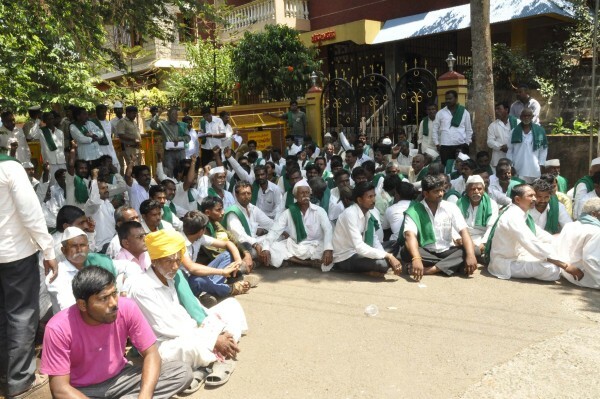 Farmers from the district today took out a protest rally from Chennamma circle and culminated the same at MP Suresh Angadi’s Residence. The farmers were protesting the new Land acquisition bill and also shouted slogans. The farmers were irked when Mr.Angadi said that this was a Congress sponsored agitation against him and BJP. What moderation you do if persons like Ashok use derogatory remarks, Mr.Angadi may not be good but if he is 3 times elected member he is layak. Secondly without understanding Land acquisition bill these protests are just political frustration by Non-BJP parties. Well said Sanjay and see its done , I want the AAB editor to be sensible but also courageous. I AM NOT SUPPORTER OF ANGADI but what has he said is correct. Congress plays cheap politics, who knows from where these so called farmers came? Congress has a long history of doing wrong all the time (Guru of all wrong doings), has ruined this country for a long time by vote bank politics, time has come people should understand. This is just a beginning,,,The farmers should get in his house & catch hold of him and ask what the hell has he done for farmers during his entire Political carrier (being elected 3 times). Has he struggled for the sake of farmers, has he seen how piety their condition is,, If he is too much interested in the “Land Acquisition Bill” then let him give his own Land for the development. 2) “BJP President Amit Shah formed an eight-member committee to seek farmers’ suggestions on the proposed land acquisition legislation which has been stoutly opposed by several farmers’ organisations. So our farmers keep on protesting infront of his house until he realizes that Farmers are the bread source of “Our Belgaum” & “Our Country”, and he withdraws the Bill @ center.